The 1434 CleverTech² Hose End Crimper repairs 1/4" to 3/4" hose on the farm, in the shop, on the job site, on the road, in the mine, off-shore and on the line. The tool's small size (under 3lbs and 10" long) allows it to be used right on the spot in places no other hose machine could possibly be used. No wasted effort removing the whole hose assembly and the obstructions that may cost hours in lost time. If you are in a remote area or hose failure stops your equipment dead in its tracks--no problem--this tool is completely hand operated, no power source is needed. 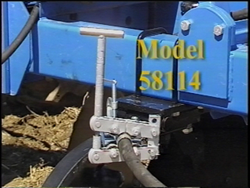 Simple rotating motion crimps the hose end in minutes. Save money on custom fabrication and allow more hoses to be repaired rather than replaced. Saves downtime and trips to town or the repair shop. It allows you to keep your machinery running after hours and on weekends while it's a fraction of the cost of other systems. So affordable, every equipment owner should have one! So practical, no mechanic should be without one! All Rights Reserved © 2014. Clevertech² Inc.